Mullah Nasruddin Khodja is a wise man famous throughout the Muslim and some parts of the non-Muslim world since the 16th century. Historical documents show that he lived in the 13th century in Anatolia (today Turkey). He was a scholar (âlim) or at least an educated man. His jokes were narrated for centuries between people for different purposes, some for humour and some to tell as stories full of meaning and wisdom. 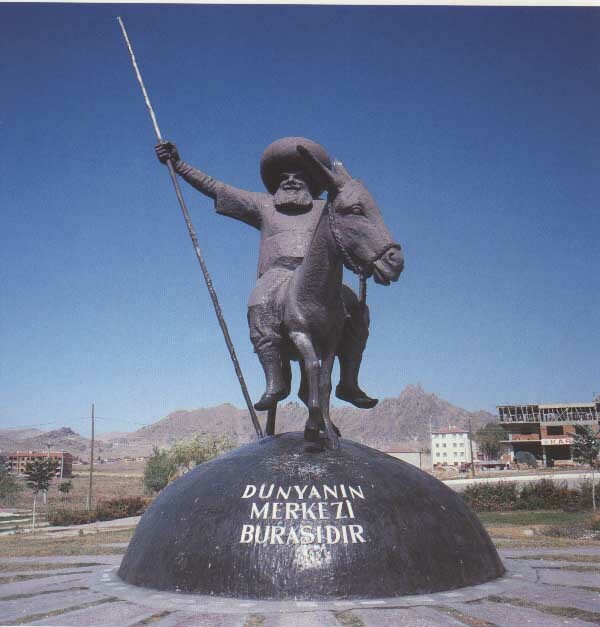 Figure 1: Backwards, no less... A statue of Mulla Nasruddin in Aksehir. (Source). Nasruddin Khodja, known also as Mulla Nasruddin or simply Nasruddin, is the starring character in a vast number of amusing tales told in regions all over the world, particularly in countries in or near the Middle East. Each tale depicts Nasruddin in a different situation, and through his viewpoint they humorously reveal commentary and lessons on various life themes. The great allure of the Mulla Nasruddin tales is that they are funny as well as lesson filled, philosophical, and thought provoking. According to different sources, Nasruddin Khodja was a philosopher, wise, witty man with a good sense of humour. His stories have been told almost everywhere in the world, spread amongst the tribes of the Turkish World and into Persia, Arabia, Africa, and along the Silk Road to China and India, later also to Europe. Of course, all these stories currently attributed to the Khodja for about 700 years haven't originated from him. Most of them are the product of collective humour of not only Turks but also other people of Islamic and Asian cultures. Nasruddin is known to us under different names in the world. 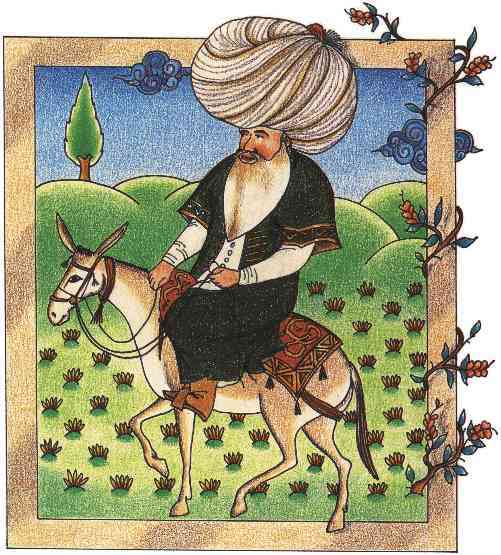 The main variants are: Turks say "Nasreddin Hoca", for Kazakhs he is "Koja Nasreddin"; Greeks call him "Hoja Nasreddin", whilst Azerbaijanis, Afghans and Iranians refer to him as "Molla or Mulla Nasrudin;" in the folklore of Arab peoples in the Middle East and North Africa, he is "Juha". Some spellings of the Arabic form of his first name Nasr al-Din are: Nasreddin, Nasruddin, or Nasr ed-din. The year 1996 was proclaimed "Nasreddin Hoca Year" by UNESCO. He is, now in 2007, 799 years old. Figure 2: The ever-smiling Khodja riding on his bronze donkey in Bukhara. (Source). Nasruddin was the label of the most popular character of humour prose narratives in the whole area of Turkish-Islamic influence, ranging from the Balkan area to the Turkish-speaking peoples of Central Asia and in other areas of the Islamic world. He is a renowned personality whose historical existence is still problematical, as the various theories regarding his biography did not succeed to build certain facts. From the 16th century onwards, this personality served increasingly as a point of crystallization for an otherwise formless, popular tradition of aphorisms, epigrams, jokes, jests, and anecdotes of different origins. Stories credited to Nasruddin Khodja can be found in manuscripts from as early as the 15th century. The earliest story occured in Ebu'l-Khayr-i Rûmî's Saltuk-nâme (1480). According to anecdotes in this book, Nasruddin was a dervish of Seyyid Mahmud Hayrani in Aksehir, in the northwest of modern Turkey. Other anecdotes about him in the Turkish language are quoted in Lami Celebi's (d. 1531) story book Letâ'if. However, there is no exact agreement among chroniclers as to the real identity of Nasruddin Khodja. 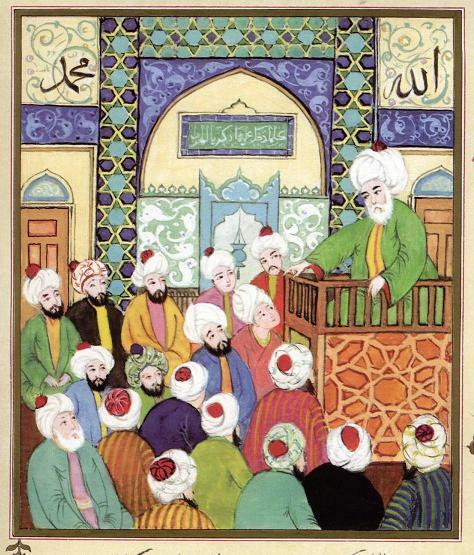 While Lami Celebi mentions Nasruddin as a contemporary of Sheyyad Hamza (14th century), the decisive influence for subsequent popular tradition, and notably, later European learned discussions, derives from Evliya Celebi, who visited Nasruddin's alleged tomb in Aksehir in the 17th century and quotes an anecdote in which Nasruddin is depicted together with the Mongol ruler Timur-leng, who died later (d. 1405). In later centuries, Hüseyin Efendi (d. 1880), the Mufti of Sivrihisar, writes in Mecmua-i Maarif that Nasruddin was born in 1208 in the village of Hortu (today Nasreddin Hoca Köyü) in the region of Sivrihisar and died in 1284 in Aksehir, the town to which he had immigrated. According to this source, he was educated respectively in Sivrihisar and Konya schools. He learned fiqh (jurisprudence) and met Mawlana Jalal al-Din al-Rûmî (1207-1273) in Konya and learned Sufism from him. He followed Seyyid Mahmud Hayrani as his Sheikh. By doing so, he went to Aksehir and married there. He became an imam and, later, a judge there. In this city, his high sense of humour and smart comments, decisions and anecdotes made him a notable and sought after member of the society. There are two different deed of trustee documents (waqf-nâme) mentioning Nasruddin's existence in the middle of the 13th century in Konya. One of them belongs to Seyyid Mahmud Hayrani in 1257, while the other one pertains to Hajj Ibrahim Sultan in 1266-67. Nevertheless, there are limited established facts about Nasruddin Khodja's life. It is certain that he lived in Anatolia in the second half of the 13th century. An acceptable fact also is that he was born in Hortu, a village in Sivrihisar in the region of Aksehir in the late 13th century, and then settled in Aksehir city, and later in Konya. His tomb is in the city of Aksehir, near Konya. His grave has an iron door with a huge padlock on it. But if one intends to pay him a visit, there is no need to feel dispirited by the locked door. There are no walls around the grave !! Figure 3: A drawing of Nasruddin reproduced in the article in Wikipedia, without description. (Source). Another element is linked to Nasruddin Khodja's biography. There is a tomb stone in the Mawlana Jalal al-Din al-Rûmî's graveyard which is said to be Nasruddin's daughter Fâtima. According to the tomb stone she passed away in 1326. This tomb stone supports that Nasr al-Din lived late in the 13th century around Konya. The early manuscript tradition of anecdotes on Nasr al-Din presents a comparatively small collection, which in following centuries was continuously enlarged. The printed collections in Northwest and Middle-Asiatic Turkish languages mostly derive from the first Tatar imprints, themselves, constituting almost identical renderings from the Ottoman Turkish sources. Nasruddin stories started to collect from the 15th century onwards. But they were first printed in 1837 in Istanbul in Matbaa-i Amire (Royal Printing House) with the title Letaif-i Hâce Nasreddin (Pleasant stories of Khodja Nasruddin). 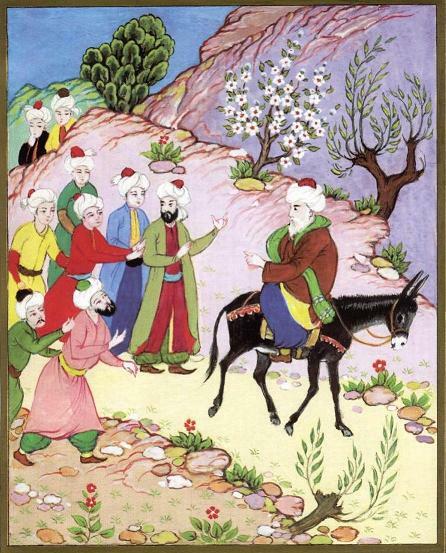 The first miniature of him was painted in a 17th century manuscript held now in Topkapi Palace Museum Library. This miniature depicts him sitting backwards on his donkey. 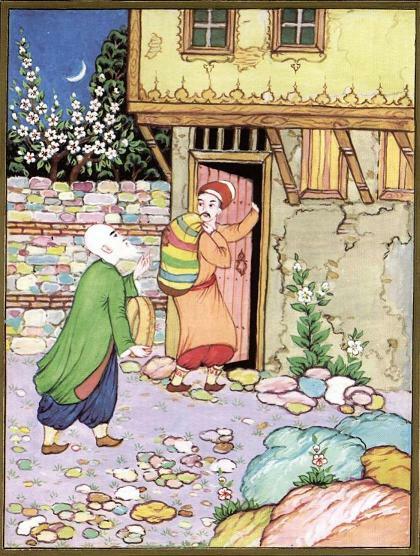 Beginning in Turkish tradition, Nasruddin's reputation soon extended all over the provinces of the Ottoman territory, the character meanwhile integrating narrative materials originally attached to other characters. Beside Turkey, Nasruddin himself and his anecdotes are well known in different places of the world, especially in Arabic and Persian folklore. His stories are told in a wide variety of regions, and have been translated into many languages. In many areas, Nasruddin is a major part of the culture, and he is quoted or alluded to frequently in daily life. Since there are thousands of different Nasruddin stories, one can be found to fit almost any occasion. His stories are renowned in various regions and languages such as Albanian, Arabic, Azeri, Bengali, Bosnian, Hindi, Pashto, Persian, Serbian and Urdu folk tradition, Croatian and Caucasian languages even in Chinese in similar name. The interchange of the additional repertoire thus introduced by the Arabic and Persian versions with following Turkish tradition has not yet been scrutinized. Yet it is obvious that at the latest by the end of the 19th / beginning of the 20th century, Nasruddin had gained such an amount of popularity in the whole region under Ottoman dominion that the origin of the narrative materials attached to him did not play a crucial role. On the contrary, it had become permissible to attach to the character any tale that might fit into the general frame outlined by popular sensitivity. From a point of view contemporary to the manuscript tradition, it may safely be assumed that these tales did not constitute a major offence; rather it is to be supposed that they represent humorous attitudes of a direct and outspoken kind, not yet submitting to restrictions by the requirements in content and form that later were established by refined literary developments. While it must remain doubtful whether the early collections represent anything that safely might be termed as "folk" literature, it seems most certain that this kind of crude story still today enjoys a large reputation. 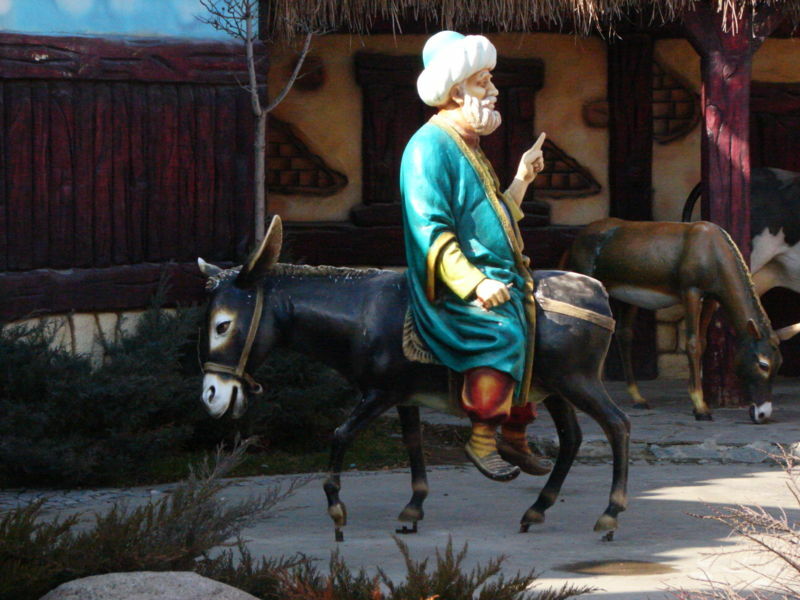 Figure 4: Backward riding statue depicting Nasruddin at the Ankara Amusement Park. Photograph taken by Nevit Dilmen in 2007. Apart from the intentionally offensive portions, the repertoire of stories attributed to Nasruddin contains a large amount of tales otherwise documented in international narrative tradition. For these tales the attachment to the character of Nasruddin is often, but one station on the way they travel throughout the Near East, the Balkan region and the Mediterranean. In this context, it may well be claimed that the majority of stories attributed to the Khodja can easily be in origin a product of the communal humour, the philosophy and the mind of the Turkish people that were widely diffused in the areas culturally and linguistically connected with Turkish influence. You have only to mention the name of the Khodja and every Turk will get ready to laugh. He has not the least doubt that he is about to hear a story which will appeal to him. Even the stories that may sound dull to others invariably have something appealing to a Turk. Take for example the story in which the Khodja throws yeast into the salt-lake near Aksehir. He knows perfectly well that just a little bit of yeast cannot ferment the great lake into yoghurt. But well, what if it should! Wouldn't it be wonderful? As generations went by, new stories were added, others were modified, and the character and his tales spread to other regions. The themes in the tales have become part of the folklore of a number of nations and express the national imaginations of a variety of cultures. Although most of them depict Nasruddin in an early small-village setting, the tales deal with concepts that have a certain timelessness. Nasruddin stories are known throughout the Middle East and have reached cultures around the world. Apparently, most of Nasruddin stories may be told as jokes or humorous anecdotes. They are told and retold endlessly in the coffee houses and caravanserais of Asia, North Africa and elsewhere, and can be heard in homes and on the radio. But it is inherent in a Nasruddin story that it may be understood at many levels. There is the joke, followed by a moral – and usually the little extra which brings the consciousness of the potential mystic a little further on the way to realization. The anecdotes attributed to Nasruddin reveal a satirical personality with a biting tongue that he was not afraid to use even against the most tyrannical rulers of his time. He is the symbol of Middle-Eastern sarcastic, ironic and satirical comedy and the rebellious feelings of people against the dynasties that once ruled this part of the world. A part of the background of the stories represent also a critical attitude against dominant social morals, where people seek selfish interest without paying real attention to principles of good doing. Some stories of Nasruddin are also adapted and used as teaching stories by Sufi order followers. This is such a common practice that, given the nature of many of Nasruddin's jokes, multiple interpretations are to be expected. Figure 5: Taken from Ahmet Yakupoglu, Stories of the late Nasr Ed-Din Hodja (Istanbul: Konya Büyüksehir Belediyesi, 1999). The late Nasruddin Khodja was on his way to the village with his son. The boy was riding their donkey. They met two women on the road and they heard one say to the other. "Oh, for the days of youth! The boy rides in ease while his old father walks. Amazing!" "Your bones are already old and dry. You've got one foot in the grave. But this young sprout, does he deserve to dry up like you? Let him ride!" After they had passed, Khojda pulled his son up onto the donkey with him. They went along under the hot sun and then they came to a group of busy bodies sitting beside the road. Figure 6: Taken from Ahmet Yakupoglu, Stories of the late Nasr Ed-Din Hodja (Istanbul: Konya Büyüksehir Belediyesi, 1999). "Oh, the cruelty! That poor animal. It's too much, two people riding! The poor beast it's about to die. Look at this guy, and he's even a Khodja!" "Oh, for God's sake," Khodja said. He got off the donkey and they walked along together, driving the donkey in front of them. But in the next moment they encountered two men standing beside the road. "Look here! Hooray for the one who can escape from the tongues of people! There will always be someone who is not pleased with your doings. So work only to please Allah." One day Khodja and his students were on the way to their lesson. Khodja was sitting backwards on his donkey. "Khodja, they asked him "Why on earth do you sit that way? Isn't it uncomfortable?" Figure 7: Taken from Ahmet Yakupoglu, Stories of the late Nasr Ed-Din Hodja (Istanbul: Konya Büyüksehir Belediyesi, 1999). Aren't we moving in here? One night a thief entered Khodja's house and stole all kinds of things. After he left, Khodja grabbed the first thing he could put his hands on, which happened to be a strainer, and followed him out the door. He followed the thief all the way to his house, and even tried to go in after him. The surprised thief said, "What are you doing in my house?" "You're bringing all our stuff here... I thought we were moving in, too. One day master Nasruddin Khodja was giving a talk from the pulpit in the mosque. "O believers, do you know what I am going to say to you?" The audience replied "NO", so he announced "I have no desire to speak to people who don't even know what I will be talking about" then he came down from the pulpit and left the mosque. Figure 8: Taken from Ahmet Yakupoglu, Stories of the late Nasr Ed-Din Hodja (Istanbul: Konya Büyüksehir Belediyesi, 1999). "Well, since you already know what I am going to say, I won't waste any more of your time" and he left them again. "The next time he comes, we'll say some of us know and some of us do not." Sure enough, another day came and Khodja stood in the pulpit asking the same question. The ones on the left said, "We know,"
And the ones on the right said, "We don't know." "Well," Nasruddin said "The half who knows what I am going to say, tell it to the other half" and he left! 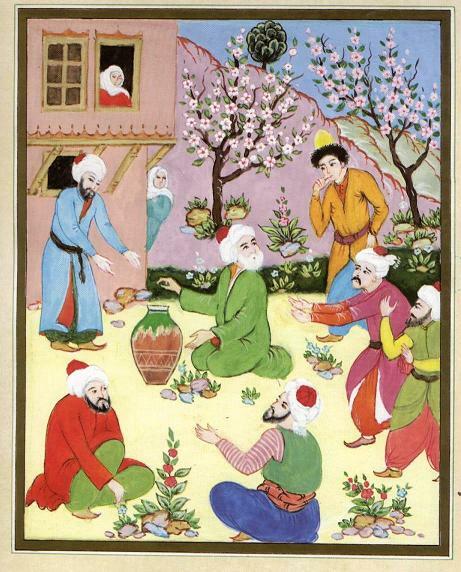 Figure 9: Taken from Ahmet Yakupoglu, Stories of the late Nasr Ed-Din Hodja (Istanbul: Konya Büyüksehir Belediyesi, 1999). One Ramadan the late Nasruddin Khodja said to himself, "why should I fast like everyone else? I'll find a pot and every day I'll throw a stone into it. When there are thirty stones in it, I'll have a feast!" But afters a few days, his daughter saw what he was up to and she threw a handful of stones in, too! A few days later- someone asked, "Khodja, what day of Ramadan is it?" "It's the forty-fifth of Ramadan." "Khodja, whatever are you saying? There are only thirty days in Ramadan!" "Oh, but I'm being very reasonable indeed! If you go by the pot's calculation, it would be the one-hundred-twenty-fifth of Ramadan!" Aryanpur Kashani, Abbas, 'Abbas., Stories of Mulla Nasr-ad-Din. Tehran: Golshan Print. House, 1970. 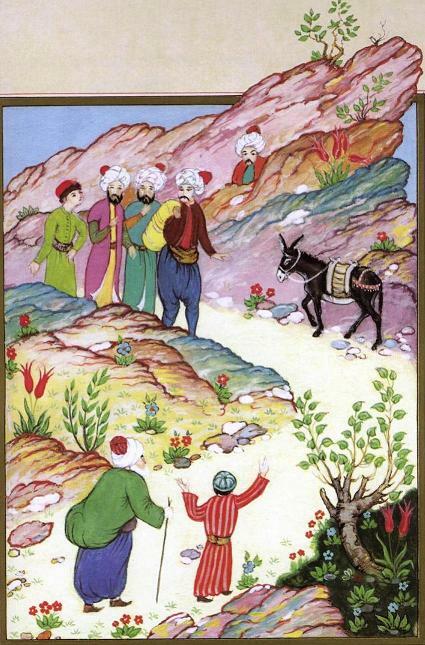 Arslan, Mehmet, Paçacioglu, Burhan., Letâ'if-i Hoca Nasreddin. Sivas [Turkey]: Dilek Ofset Matbaacilik, 1996. Ali Elmi, Haj Muhammad Bookstore, Kitabi Mulla Nasreddin Musawwar/ Book of Mulla Nasreddin, Illustrated, Elmi Press, 1331 Persian Solar year, 5th ed. Alekuzei, Rabani, Süsse Geschichten [von] Mula Nasroddin. "Aus dem AltperYakupoglu, Ahmet", Stories of the late Nasr Ed-Din Khodja, Istanbul: Konya Büyüksehir Belediyesi, 1999. Ayhan, V.A., "Turkish Humorist And Sage: Nasr Al-Din Khodja". Online at: http://www.fountainmagazine.com/articles.php?SIN=6d5dad82e3&k=606&1342323154&show=part1. Batu, Hâmit, Nasrettin Khodja, L'humour philosophique, Ankara, Imprimerie Ajansturk: [s.d.]. Beha'I, Letaifi-Nasreddin Hoca [Plesantries of Nasreddin Hoca], Istanbul, 1926. Bedickian, S. V., Turkish Gems; The Tales of my Childhood. Alleghany, Pa., Press of T. A. M'Nary, 1896. Belamri, Rabah. L'Âne de Djeha, Paris: L'Harmattan, 2000. Darwiche, Jihad, Sagesses et malices de Nasreddine, le fou qui était sage. Paris: Albin Michel, 2000. Davies, D., Goha: Tales From The Arab World. New York: Macmillan Education. "Djeha-Khodja Nasreddin: bibliographie". Online at: http://ahama.9online.fr/bibliographie.htm. Duman, Mustafa, Nasreddin Khodja books: an explained bibliography (1480-2004), Istanbul: Turkuaz Yayinlari, 2005. Fedai, Harid, "Khodja Nasreddin or Khodja Aslani of Cyprus". 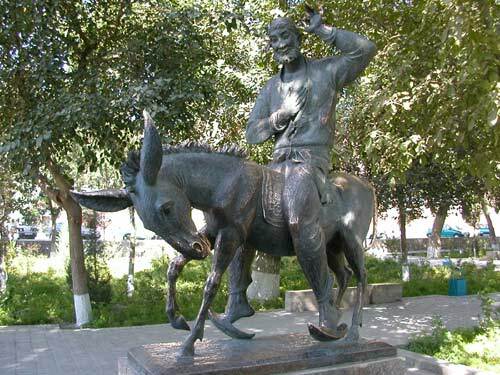 In Memory of Khodja Nasreddin. Istanbul: Olak Memorial Books, 1996. Fedai, Harid, "Mulla or Khodja Nasreddin as seen by Cypriot Turks and Greeks", Folklore: Electronic Journal of Folklore, vol. 16 (2001). Online at: http://haldjas.folklore.ee/folklore/vol16/mulla.pdf. Gölpinarli, Abdülbâki, Nasreddin Hoca, Istanbul: Remzi Kitabevi, 1961. Hikmet, Murat, One Day the Khodja, Ankara, 1959. Leroy, Didier, La sagesse afghane du malicieux Nasroddine. Paris : Editions de l'Aube, 2002, "Collection: L'Aube poche". Marzolph, U., "Nasr al-Din Khodja", Encyclopaedia of Islam, 2nd Edition, CD-Rom Edition, v.1.1. Nasreddin Hoca, Letaif-i Hoca Nasreddin rahmetulla-i aleyh, Published by. Bahai, Istanbul: 1909. Nesin, Aziz. 1988. The Tales of Nasrettin Hoca. (Illustrated). retold in English by Talat Halman and Zeki Findikoglu (Illustrator). Istanbul: Dost Yayinlari, 1988. Ohebsion, Rodney, A Collection of Wisdom. Immediex Publishing, 2004. Özkan, Isa, "The Historical Personality and Subtleites of Khodja Nasreddin", Studies on Turkish Folklore (Ankara), 1983. Shah, Idries, The exploits of the incomparable Mulla Nasruddin, London, 1966. Tecer, A. K., "Nasreddin Hoca", Islam Ansiklopedisi, Istanbul vol. 9 (1964): pp. 109-114. Tenner, Ioan Tenner, "Bibliography of Nasruddin Story: Books and Publications". Compiled by Ioan Tenner, 2004. Online at: http://tenner.thinkhost.com/stories/Bibliography%20Nasrudin%20130104.htm.